The article from Revolutionary Perspectives 10 “Autonomism – Cutting the Ground from under Marxism” has attracted quite a lot of comment and criticism. The text was not an historical treatment of the development of Autonomism, which we recognised was a heterogeneous movement extending over a period of almost two decades. It was intended to show, by looking at four elements of Autonomist theory, how theoretical errors had led the movement into a cul-de-sac. However, we recognise that some of the general comments made in the introduction are too categorical and were historically inaccurate. We are grateful for corrections of fact and for further information which has been provided, in particular by the comrades of Mouvement Communiste. 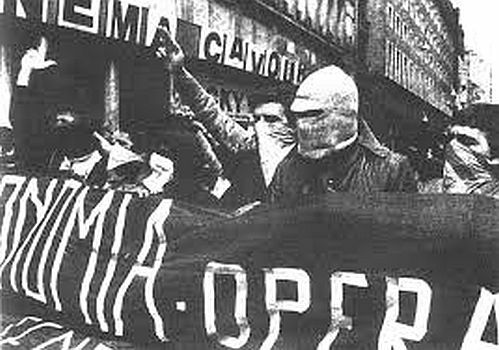 LC called for voting for the PCI in regional elections in 1975 and together with AO joined an electoral coalition, Democrazia Proletaria5, in 1976. Later both organisations called for voting for the PCI in national elections. The call for voting for the PCI in national elections was launched after the so-called “historic compromise” or democratic alliance of the PCI with the Christian Democrats in 1976. However, when the US entered the war, the IWW regarded the war as simply an interruption to building the organisation. It gave no political direction to its sections and left it up to each section to decide its attitude to the war. One of the most militant sections at the Philadelphia docks, which had carried out a massive and successful strike in 191321 saw hundreds of its members sign up for the military, and agreed a no-strike pact at the port for the duration of the war.22 This is another illustration of the need for a clear political organisation which is able to give a political lead in times of crisis. It also shows the failure of attempts to give the economic struggle precedence over the political struggle. 3. Potere Operaia collapsed in 1973, Lotta Continua in 1976 and Avanguardia Operaia in 1978. 5. This coalition included a spin off from the Italian Socialist Party (PSIUP) and a Maoist group. 6. Confederazione Generale Italiana del Lavoro. The largest Italian trade union. 8. G. Sbrogio, a militant from Porto Marghera autonomous assembly spent 4 years and 8 months in gaol accused of being the brains behind the Red Brigades. This is just one example of many workers who were falsely imprisoned by the state. Their real “crime” was fighting for working class interests and so threatening capitalist exploitation. 13. This is the assessment of PCInt. 14. This is articulated by Emanuela Furlanetto who participated in the self-imposed food price reductions. See the video “The Suspended Years” available from Mouvement Communiste. For more on Gramsci see leftcom.org. We will be publishing a translation of Onorato Damen’s Gramsci: Between Marxism and Idealism later this year. 15. COBAS acronym for Comitati di Base, or rank and file unions. 17. The Angry Workers of the World (AWW) and Mouvement Communiste support this position. 19. AAUD-E was the General Workers Union – unitary organisation. 22. This did not, of course, prevent the bourgeoisie from attacking the organisation, smashing its offices and imprisoning its leaders for terms of sometimes 10 to 20 years. IWW members were branded as first as spies of the Kaiser and later after October 1917 spies for the Bolsheviks!